Non-intrusive welcome wizard. Should offer to create a new model (list all models from template directory), load an existing model, and re-open any of the last 10 opened models. Should only appear when no model is loaded and disappear as soon as one is. Should be a non-model sheet/binder on the workspace. Everything still works as normal and the sheet/binder disappears as soon as a model has been opened. Mockup attached; left is normal view with just one template in templates directory; clicking on anything (but Recent nets) performs the action, Recent nets are collapsible. 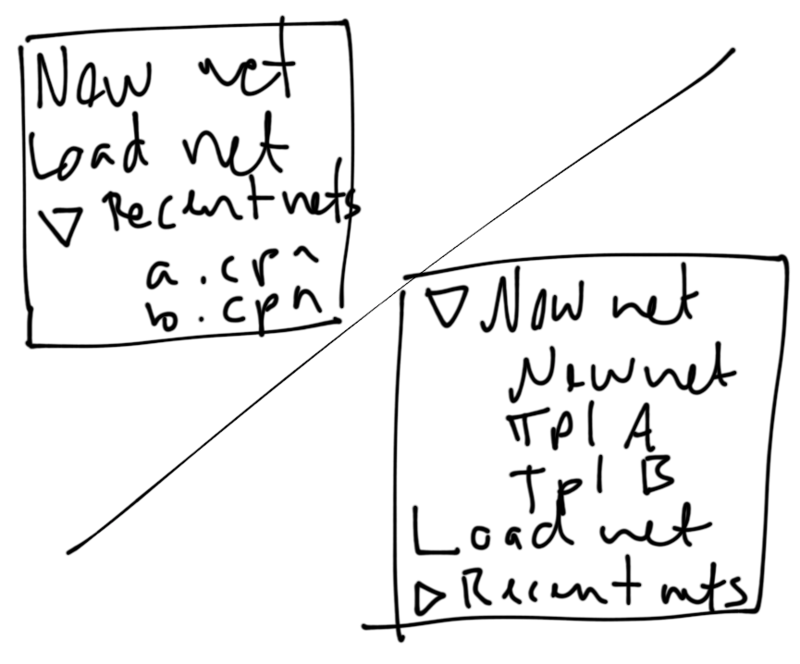 New net just creates a new blank net (and closes wizard), Load opens load dialog (and closes wizard). Clicking on recent nets collapses/uncollapses it, and clicking on any child of recent nets opens that net. The right shows the situation when the templates directory contains multiple models. Each template is listed and when opened are opened as new nets; Recent has been manually collapsed for space.